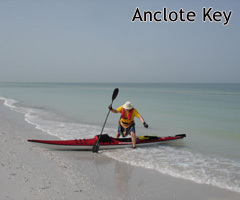 Central Florida Kayak Trips is your guide to kayaking in the central Gulf Coast region of Florida, USA. We hope to provide you with incisive text and vivid photos so that you may easily develop your paddling skills and seek out the most spectacular scenery that Florida has to offer. If you are new to the sport of kayaking, or just want to learn more about equipment and accessories, select the "Equipment" link to the left of this text. There you will find a complete list of gear that will get you down black-water rivers, crystal clear springs or to sun-drenched island beaches. Once you're ready to begin, select "Basics". You'll learn about paddling skills, safety and how to deal with Florida's unpredictable weather. "Trips" will take you to some of our favorite kayaking locations. We've identified the necessary skill level, trip duration, provide touring instructions and noted areas of special interest. If you prefer a canoe to a kayak, don't worry, you'll be able to go on many of these trips as well. Check back often as we add new pages on a regular basis. The "What's New?" section lists what has been added to this web site in the last few months. Our paddling friends have contributed pictures for your enjoyment. Click here to view their photos or check out Green Wave Forum for more trips, comments and chat about kayaking and canoeing in Central Florida. Come join the fun and let's paddle Central Florida today! On the web since June 1999.